Favourite Colour: White or black, an answer he gave in Saiyuki Reload Graffiti because "thinking about it is annoying"
Favourite Foods and Drinks: Sweet things (especially bean paste items), rich things (such as mayonnaise), and sake. To the dismay of those around him, he has no sense of taste, as evident from his preference for ramen with mayonnaise and flat carbonated drinks. Hated Foods: Whatever he feels is unappetizing. Those around him find this rather hard to comprehend. Special Talents: His precision with paper fans, singing (when drunk), and speaking. Genjou Sanzo, commonly referred to as simply Sanzo, is hardly the traditional image of a Buddhist priest; he is ill-tempered, swears, eats meat, drinks, and is usually seen with a cigarette hanging from his lips. As a Sanzo priest, he is tasked with protecting the sacred Maten Scripture, one of The Founding Scriptures of Heaven and Earth. The Maten's government over evil and the principle of yin allows Sanzo to banish demons and purify evil. 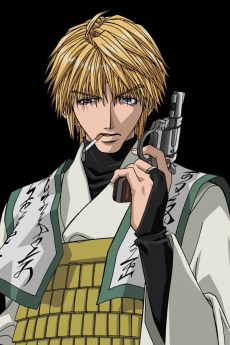 Sanzo also possesses a Smith & Wesson shoureijuu (banishing gun), which he is often seen wielding in battle. At the start of the story, he was bidden by the Sanbutsushin (Three Aspects) and Kanzeon Bosatsu to journey to India with his three companions to stop the resurrection of the demon King Gyumaoh. Before Sanzo was bestowed his present title, he was known as Kouryuu, the river orphan. He was found by his mentor Koumyou Sanzo when he was just a baby, abandoned to float downstream. Koumyou raised and taught him, and was held by Kouryuu in high regard. Shortly after Kouryuu was named as Koumyou's successor, Koumyou was killed while protecting Kouryuu from demons that were raiding their temple looking for the holy scriptures. They succeeded in stealing the Seiten Scripture that Koumyou bore, but left behind the Maten Scripture. The young Genjou Sanzo subsequently went on a search to recover his master's stolen scripture, but was unsuccessful. Several years later, he came under the employ of the Sanbutsushin in order for them to help him with his task. Although he remembers his master fondly, Sanzo is often haunted by the memory of Koumyou's death. He despises the rain due to how it poured on the night of his master's death, and often broods whenever it falls from the sky, usually refusing to go out into it. Despite Sanzo's undeniable abilities, he often feels as though he is unworthy of the title that his master bestowed upon him. He strives to become strong enough to one day see himself as deserving of it. In his previous life, Sanzo was the god Konzen Douji, the nephew of the Merciful Goddess Kanzeon, who is often seen watching over Sanzo and his group from her place in heaven. He was an ill-tempered bureaucrat who had no joy or excitement in his immortal life until it was turned upside down by being named the caretaker of the young Son Goku. Although reluctant at first, he subsequently became very attached to his charge.